Limbs 4 Life’s free Amplified magazine is distributed nationally free of charge in digital and print formats. Featuring profiles and perspectives from amputees, Amplified also covers a diverse range of topics including health and wellbeing, advocacy and articles relating to amputees. This Autumn edition features an in-depth article about phantom pain and personal profiles including mighty mum – Mandy McCracken. Download your own copy of the latest edition of Amplified. 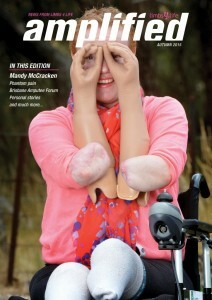 If you would like to receive future copies of Amplified visit www.limbs4life.org.au and join the mailing list.